When I started recording readings of these books, I chose to offer them in OGG Vorbis format because it’s a free and open standard. That meant there would be no encumberances on the audio files due to patents or any kind of imaginary property (IP.) That’s important to me. I have licensed my novels with Creative Commons enhancements to their copyright, to ensure their freedom. 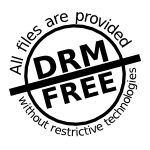 They are not weighted down with digital restrictions management (DRM) because I want readers and listeners to be able to enjoy my books without having to restrict themselves to any single device or place. I use Free Software to write the books, and to convert them to useful formats, which are also free and open. I use Free Software to produce the audio recordings, and I use open standards to present them. For the audio, that meant OGG Vorbis, the best choice for the lossy compression needed to make the file sizes reasonable for downloading. At the time, the more popular format, MP3, wasn’t free or open. It was locked in a proprietary web of patents. I couldn’t insult my listeners by offering them something like that. It’s possible that this choice has meant fewer downloads of the readings because many people only recognize MP3 and might be unwilling to download something with a strange name like OGG. I was willing to take that risk because freedom and openness are important to me. Lately the patents on the MP3 format have run out. Well, as far as I can tell. There were a mess of them held by a mess of people and organizations and I don’t have the training or experience to sort that all out myself. I rely on other sources for that, and they’re all saying that, once the patents finally ran out in the US, MP3 became an open standard. They hedged a little on that, apparently unwilling to commit themselves fully in the face of the the, uh, complexities of IP. I was hesitant too, but I decided to take the plunge and accept MP3 as an open standard. This meant that I could finally offer people the readings in a format that they recognized. This is good because, even though all modern operating systems and devices should be able to handle OGG, it sometimes requires the extra step of installing some necessary software to do so. People don’t like extra steps. After paying, sometimes quite a lot, for their operating systems and devices, they shouldn’t have to take extra steps to get them to handle a simple open standard like OGG. That’s annoying, and now I can finally make it a little less annoying for them by offering my audiobooks in MP3 format. This entry was posted in Uncategorized and tagged audiobooks, copyright, creative commons, downloads, free software, freedom, open source, public domain, readings. Bookmark the permalink.